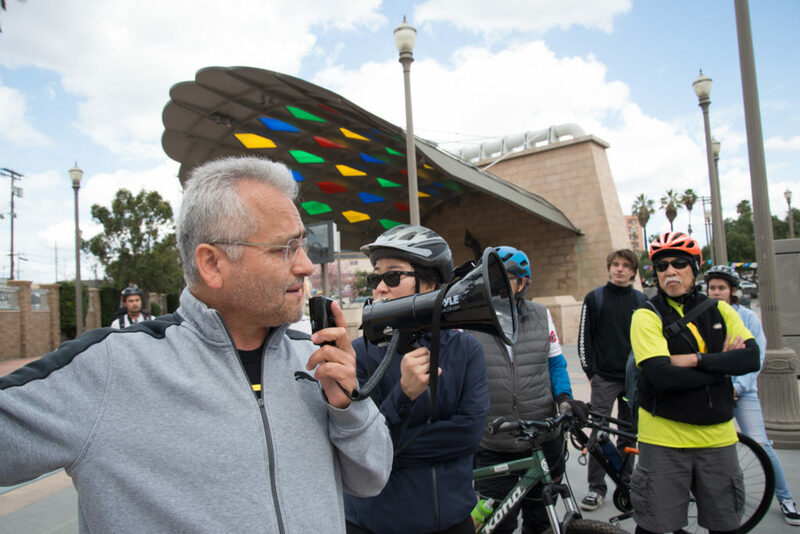 Last Saturday (March 9th), APIFM partnered with Sustainable Little Tokyo, the Japanese American Cultural and Community Center, and Metro on a Jitensha Little Tokyo bike tour from Little Tokyo to Boyle Heights. Fun fact: jitensha (written じてんしゃ) is the Japanese word for bicycle! It also means “self-driven vehicle.” It is comprised of two characters: ji (self), ten (turn, roll), and sha (vehicle, wheel, car). 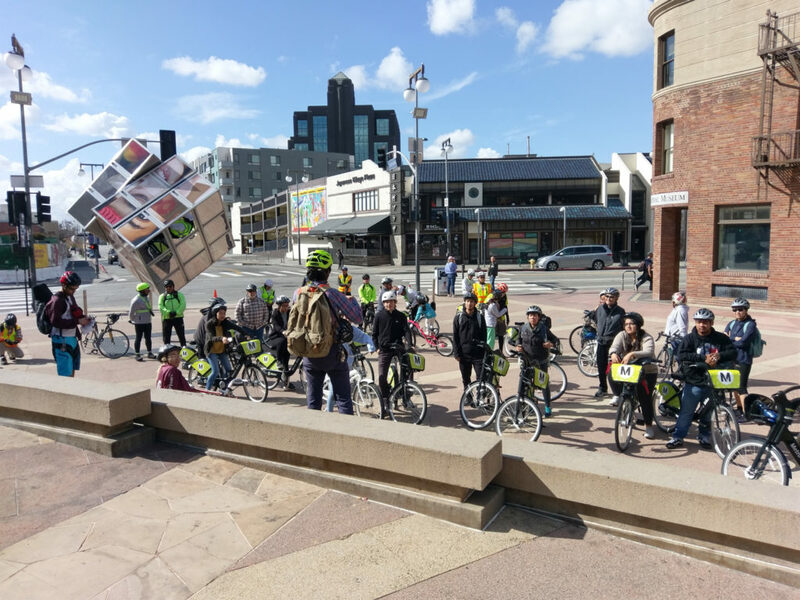 Jitensha Little Tokyo is a coalition of Nikkei community organizers that organize bike tours for a healthy and sustainable Little Tokyo community. 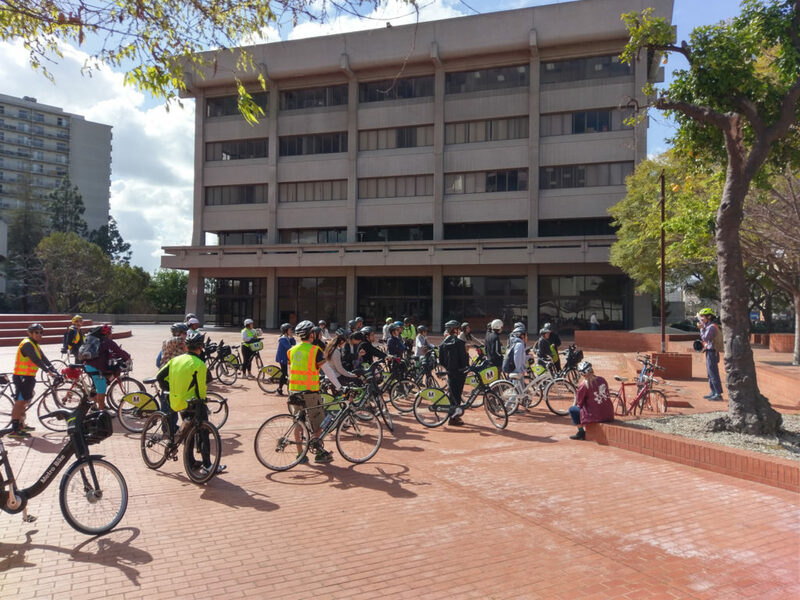 Before this ride to Boyle Heights, the Jitensha LT crew hosted a few fun, community rides including a Watts to Little Tokyo ride, a Historical Little Tokyo ride, and a Nisei Week ride. 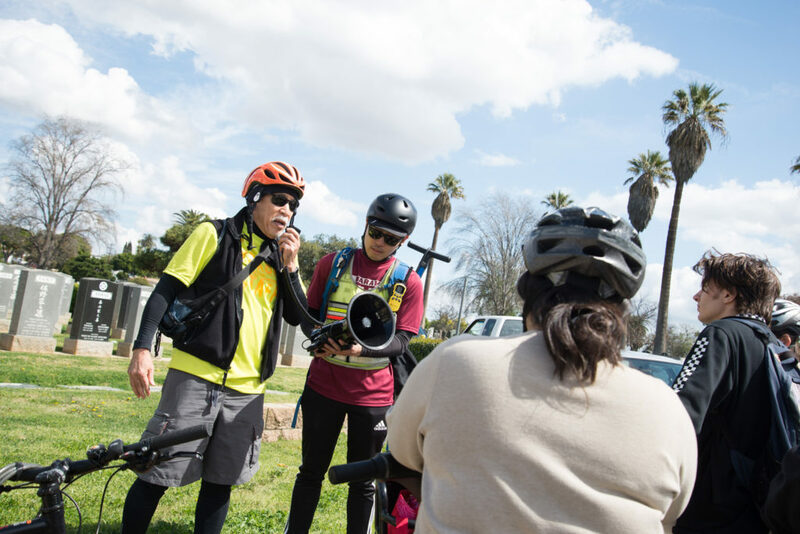 We had over 40 riders come out to learn more about the history of Little Tokyo and reconnect our historic Japantown with the history of Japanese Americans in Boyle Heights and the thriving Latinx/Chicanx community there now! Key stops and speakers included the Japanese American National Museum and the Japanese American Cultural and Community Center with Scott Oshima, Hollenbeck Park with Kathy Masaoka of Nikkei for Civil Rights and Redress, Casa del Mexicano with Quetzal Flores of East LA Community Corporation, Evergreen Cemetery with Steve Nagano and Jeff Chop of Little Tokyo Historical Society , and Mariachi Plaza with Carlos Ortez of Un Solo Sol. 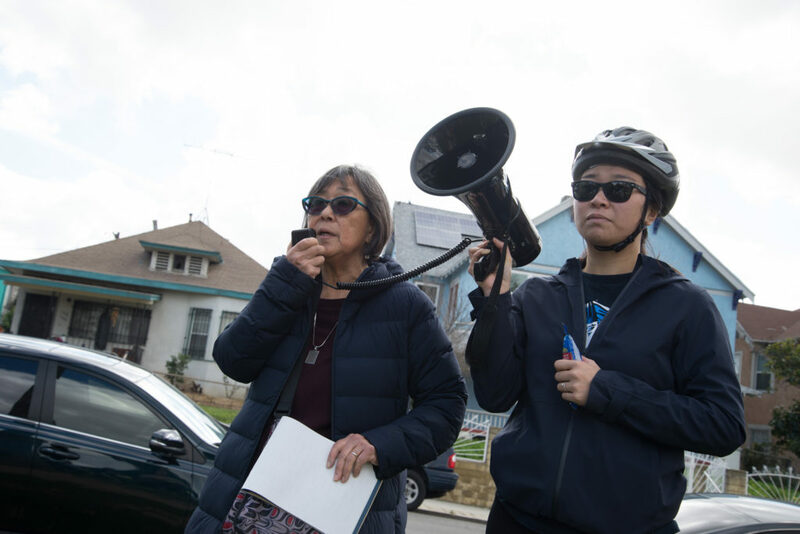 Riders had the chance to hear firsthand from community activist leaders about Little Tokyo and Boyle Height’s community struggle to sustain their history, culture, and legacy small businesses despite the waves of development and gentrification. Special thanks to all of our amazing partners, speakers, and the Metro Bikeshare for making this ride possible! Be on the lookout for the next #JitenshaLT bike tour from Little Tokyo to Sawtelle this Summer! 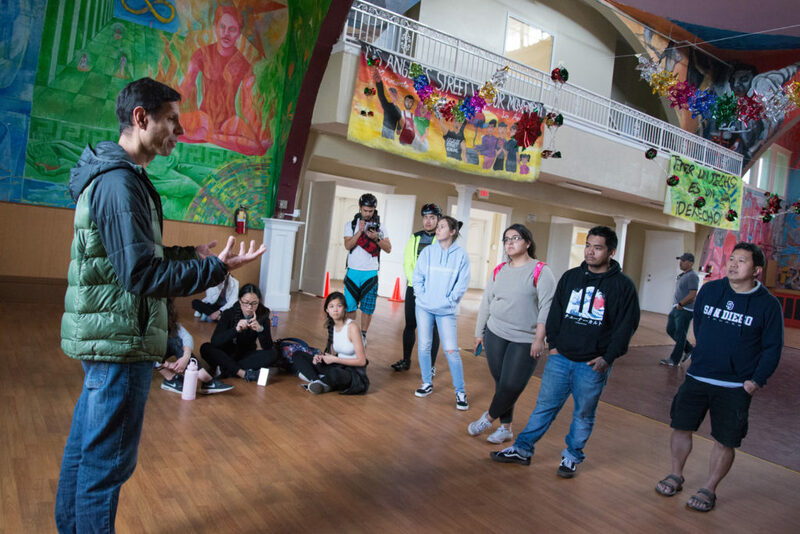 Most days, Viet Bui commutes by bike to his job as an academic advisor at the University of Southern California Thornton School of Music, where he has worked for the past three years. He only recently rediscovered his passion for cycling since leaving the corporate banking world in 2012, returning to school for a master’s degree in education. Bui did not learn how to ride a bike until the age of 11 or 12, when he was finally motivated to teach himself after watching other kids on the block. Eventually, he began to ride to school and on boy scout cycling trips. Now, Bui considers himself a biking enthusiast who cycles both for the health benefits of the sport and as a means of stress relief. He usually prefers to ride solo, citing the opportunity for contemplation and meditation that cycling alone allows him. Naomi Iwasaki, a Los Angeles native, is a self-proclaimed transportation nerd. “You know how people talk about an acting bug? You act and you just get bit by this bug and you love it and you want to be an actor? I think that there’s a transportation nerd bug also, and that some people just love maps and love buses and love the way that people circulate throughout a city. I’m one of those nerds,” Iwasaki said. As such, she is well-suited for her job as director of neighborhood services and Great Streets at the office of LA Mayor Eric Garcetti, where she works with city departments such as the Department of Transportation (DOT) to oversee projects designed to improve street safety, design and development.